It started with the swearing in of a Democratic-majority City Council. Then came the loss of the Chargers to Los Angeles. Next, a failed special election effort to secure an early win for SoccerCity plan for the Qualcomm Stadium site. The Democrats pushed it to the fall of 2018, when the odds of success are lessened due to a higher voter turnout. Then, the admission by one of his allies, Republican Councilman Chris Cate, that he leaked a confidential document about said proposal—which constitutes a misdemeanor offense—and is punishable by the possible loss of his seat. And, the topper — the hepatitis A outbreak that has generated national and even international headlines, plus two state-of-mergency declarations. One declaration is because the outbreak itself has yet to abate. And the other is because the Centers for Disease Control and Prevention can no longer meet California’s hepatitis A vaccine demands. Despite constant protestations to the contrary, there is no sense suggesting that our civic leaders knew nothing. Several grand jury reports warned of such an outbreak starting over a decade ago. So, let’s start with some simple questions about a glaring lack of common sense. Didn’t the mayor ever walk his city? The smell of urine and feces on sidewalks, in the bushes—and, the homeless sleeping in the doorways of businesses—has been overwhelming for years. Didn’t he ever stroll outside his office? Take a little lunchtime walk around City Hall? Didn’t he ever visit Ocean Beach, Hillcrest, Southeast San Diego, the environs around Balboa Park, the East Village, Clairemont and City Heights? Or listen to the neighborhood and business complaints about the homeless and unsanitary conditions? Those walks alone would have compelled the “too little, too late” responses now in evidence—vaccinations, power washing sidewalks, hand washing stations, public notices, tent cities—much sooner. It is basic “health and safety” sanitation. Why did the city neglect or minimize this essential maintenance? And why didn’t the mayor inform the people of San Diego as soon as he knew there was a hepatitis problem in the city? Also, why was the public the last to be informed? City officials, employees, first responders, vendors, and others were notified of the outbreak long before the public. Why? Concerns about an outbreak didn’t just start in the summer of 2017. They started long before the first cases were diagnosed in November 2016. What so preoccupied the mayor that the hepatitis scourge went unaddressed? Too busy with negotiations to keep (or lose) the Chargers? A convention center expansion (in limbo)? The insider track for Soccer City? A push for a June 2017 special election with a price tag of $500,000 (which failed)? Surely, none of these issues—all of which either failed or are on life support—ranks in importance to the “health and safety” mandates of the city charter. Think about it: The latest hepatitis A numbers—18 dead and nearly 500 infected—in San Diego. And the CDC predicts the scourge could last years. Fear not. Even though “the percentage of human feces in the San Diego River and seven tributaries quadrupled in 2017 as compared to the previous year, while the total volume of waste was estimated to have increased 15 fold,” the city is not convinced the homeless encampments are to blame. Or that they need to test the water more frequently. Rather, they contend, it is the rains, leaky pipes, and not the homeless and/or illicit drug users that pollute the river bed. At least Councilwoman Lorie Zapf sounded that alarm. In July, she alerted county health officials that “four cases of hepatitis A including one death have been linked to the San Diego River Valley.” She, of rare common sense, walked the river and led a long overdue clean up effort. The county has already spent $3 million on the outbreak. The city’s financial costs are still being tallied. Taxpayers will surely be on the hook in a number of mass tort case lawsuits as the outbreak continues. 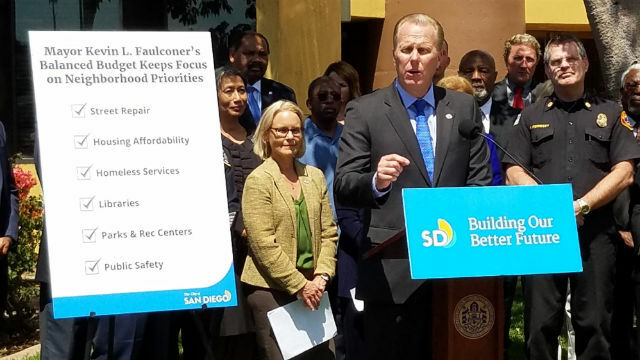 Ironically, one news outlet dubbed this Faulconer’s “Katrina” moment. In this very bad year, Faulconer is no longer the Republican rising star headed for statewide office. Colleen O’Connor is a native San Diegan and a retired college professor.